Medal of Honor recipient Hershel Williams salutes as the national anthem is sung before the Military Bowl football game in Annapolis, Md., on Dec. 28, 2015. WASHINGTON — Days after receiving criticism from a national veterans organization for rejecting an advertisement urging players and fans to stand during the national anthem, the National Football League announced Thursday that it would honor veterans during Super Bowl LII. Fifteen Medal of Honor recipients will be part of the Super Bowl coin toss ceremony on Feb. 4 in Minneapolis, the NFL announced. The game pits the Philadelphia Eagles against the New England Patriots. World War II veteran Hershel “Woody” Williams, 94, will flip the coin, surrounded by the other Medal of Honor recipients. Williams received the Medal of Honor in 1945 for his actions during the Battle of Iwo Jima. The announcement was made just days after American Veterans, known as AMVETS, spoke out against the NFL for rejecting a print advertisement the group submitted for the official Super Bowl LII programs. 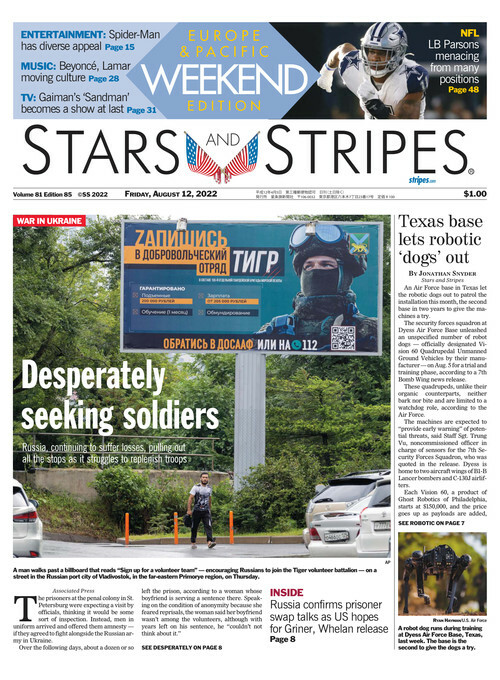 The full-page ad pictured the American flag, soldiers and the words “Please Stand,” referring to the movement of NFL players protesting racial inequity and injustice by kneeling during the performance of the national anthem before the start of games. Following the outcry, NFL Vice President of Communications Brian McCarthy said official Super Bowl programs should not be used for political messaging and that AMVETS was given an opportunity to amend their ad. The NFL emphasized Thursday its efforts to honor veterans and the military, including its season-long “Salute to Service” military appreciation initiative. The league also partners with military nonprofits TAPS, USO, Pat Tillman Foundation and Wounded Warrior Project.